The prompt this time was a piece I read aloud about Tundra Swans. See the long prompt (and what I wrote in response) below. True to its name, the Tundra Swan breeds on the high tundra across the Arctic, migrates many miles to warmer weather—up to 3,700 miles round-trip—in cross-continent migration. Tundra Swans make the daunting journey twice each year. They arrive at their breeding grounds around mid-May, and head south for winter quarters around the end of September. Though large populations winter in North America, the breeding range extends across the coastal lowlands of Siberia, and from the Kola Peninsula east to the Pacific. They can be found in the White Sea, Baltic Sea and the Elbe estuary in Denmark, the Netherlands and the British Isles, as well as Algeria, Iraq, Palestine, Libya, Nepal, Pakistan, and the Marianas and Volcano Islands in the western Pacific. Tundra Swans winter on the water and sleep afloat. Tundra Swans sometimes feed during moonlit nights. Tundra Swans mate for life. They mate in the late spring, usually after they have returned to the nesting grounds. They pair up for nearly an entire year before breeding. Though in their winter grounds they gather in huge flocks, they breed as solitary pairs spread out across the tundra. Each couple defends a territory of about three-fourths of a square mile. When mating, the birds face each other, wings partly spread and rapidly quivering, while they call loudly. 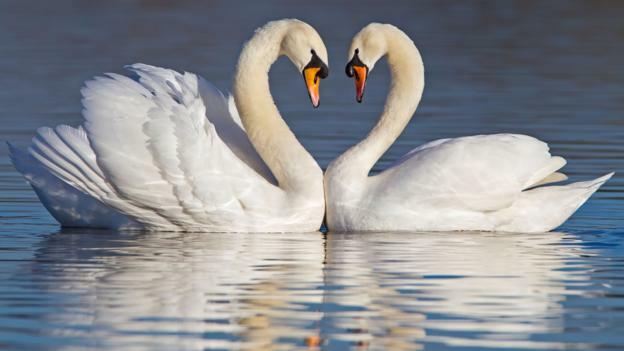 Tundra Swans pair monogamously until one partner dies. Should one partner die long before the other, the surviving bird often will not mate again for some years, or even for its entire life. Despite the tundra swan’s dedicated efforts, its entire breeding season is subject to the whims of the Arctic climate. Love? It’s for the birds, we say, along with other birdy expressions: building nests, nest eggs, guiding fledglings to take flight, empty nest syndrome. I mean, okay, I don’t actually know if birds love one another or not, but it’s more likely they are simply biologically driven to reproduce and help their young survive to propagate the species, just like other animals. Doesn’t the lioness fiercely defend her cubs for this reason? She wouldn’t think twice about swiping your face off with one paw if you approach her and her family, but is that love or instinct? I’m more like the whale, I guess, sounding out a mating call with the other males. I want the slippery skin on skin, the moaning pleasure, the climax. I’m a Bonobo, masturbating others to help them sleep. I’m a tomcat: multiple partners and then I sleep all day. I don’t have the resilience it takes to fly 3,700 miles and then wait a year to mate. I don’t float while I sleep (or do I?). I have never eaten by moonlight (or has it just been so long that I can’t remember?). Today, a budding psychoanalyst and I spoke about why neither of us have partners when we are each such a great catch. We live alone. We spend weekend nights with Netflix and medical marijuana. We cry sometimes in the car on the freeway on our way to being alone again. “I’ve made different choices,” I said, reminding myself out loud that I’ve been proposed to three times and said no every time. Doesn’t that prove I’ve made a choice? But what other choices are there? Especially now, with a crepey neck and reading glasses? Sure, I could be your Daddy, but for how long? Eventually, I’ll be an old bag and you’ll be all grown up, staring at young men, looking for your youth again. I want to be a Tundra Swan, so dedicated to migration patterns that I don’t even know north from south or Palestine from Nevada. I’d just follow the sun. I’d like to fly from a sitting position, to run on water with wide, webbed feet, so sure of myself, and take off, wings whistling, toward fertile fields and icy continents. But I’m just little older me, a man with gray chest hair and tired feet. A homo-Homo sapien, still not sure if loving someone for life exists in this one wild ride—or what I have left of it. Love it. Funny, poignant, real. Thanks Chris.